Abstract. Monsoon has earned increasing attention from the climate community since the last century, yet only recently have regional monsoons been recognized as a global system. It remains a debated issue, however, as to what extent and at which timescales the global monsoon can be viewed as a major mode of climate variability. For this purpose, a PAGES (Past Global Changes) working group (WG) was set up to investigate the concept of the global monsoon and its future research directions. The WG's synthesis is presented here. On the basis of observation and proxy data, the WG found that the regional monsoons can vary coherently, although not perfectly, at various timescales, varying between interannual, interdecadal, centennial, millennial, orbital and tectonic timescales, conforming to the global monsoon concept across timescales. Within the global monsoon system, each subsystem has its own features, depending on its geographic and topographic conditions. Discrimination between global and regional components in the monsoon system is a key to revealing the driving factors in monsoon variations; hence, the global monsoon concept helps to enhance our understanding and to improve future projections of the regional monsoons. 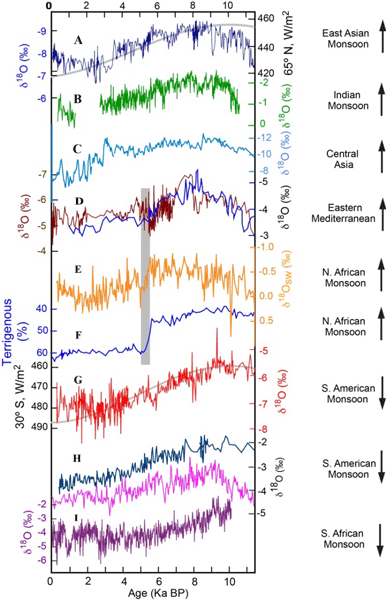 This paper starts with a historical review of the global monsoon concept in both modern and paleo-climatology, and an assessment of monsoon proxies used in regional and global scales. 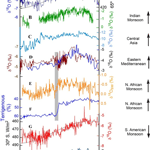 The main body of the paper is devoted to a summary of observation data at various timescales, providing evidence of the coherent global monsoon system. The paper concludes with a projection of future monsoon shifts in a warming world. The synthesis will be followed by a companion paper addressing driving mechanisms and outstanding issues in global monsoon studies. How to cite: Wang, P. X., Wang, B., Cheng, H., Fasullo, J., Guo, Z. T., Kiefer, T., and Liu, Z. Y.: The global monsoon across timescales: coherent variability of regional monsoons, Clim. Past, 10, 2007-2052, https://doi.org/10.5194/cp-10-2007-2014, 2014. All regional monsoons belong to a cohesive global monsoon circulation system, albeit thateach regional subsystem has its own indigenous features. A comprehensive review of global monsoon variability reveals that regional monsoons can vary coherently across a range of timescales, from interannual up to orbital and tectonic. Study of monsoon variability from both global and regional perspectives is imperative and advantageous for integrated understanding of the modern and paleo-monsoon dynamics.